With the start of school, Mother Nature decided that it was time to get back to normal weather patterns - so long glorious English summer of 2013 (truly glorious! ), hello stereotypical grey damp autumn. The mornings have had that lovely bite to the air that means true woolen season is just around the corner. This is absolutely my favorite time of year (although I could do with a bit less rain...). With the newly autumnal temperatures comes the ever predictable bout of startitis - I find myself wanting to cast on ALL THE THINGS! And to be fair, there are quite a number of things I should be casting on - two sample knits for patterns to be released next month first off, not to mention finishing off a shawl that's been on the needles for a couple of months now. But I find myself obsessed with the idea of casting on the perfect fall sweater - roomy, cozy, with long sleeves that come down over my hands and fronts that can wrap around. More specifially, I want the perfect fall sweater knit out of this. My combo sweater spin from last winter when I was putting the miniSpinner through it's paces. 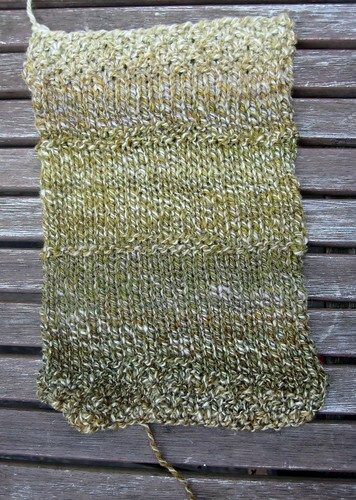 So this week, I succumbed to the overwhelming desire to cast on, and knit...a swatch. 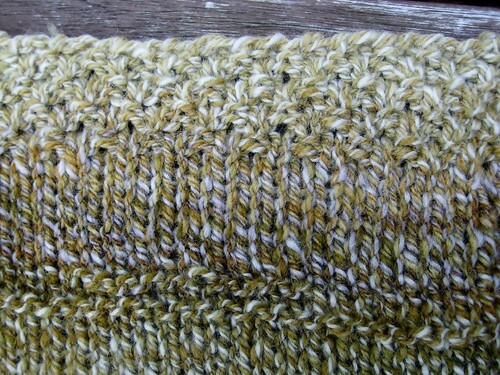 I think I've got the right needle size worked out, and I know the borders and cuffs are going to be in moss stitch. Now it's just a question of using this project as a carrot to get the other stuff done. But if I play my cards right (and am a good designer do-bee), I can have a new sweater soon. I. Can't. Wait. 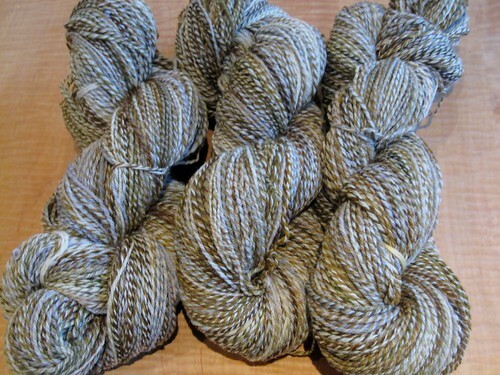 Written by porpoise On September 20, 2013 In "handspun", "swatching", "sweaters"